1)Also know as Dasham Bhav/Karam Bhav/Profession House. 2)Tenth House is Strongest Artha house of your horoscop. It is also strongest Kendra(angular/quadrant) house of your horoscop. 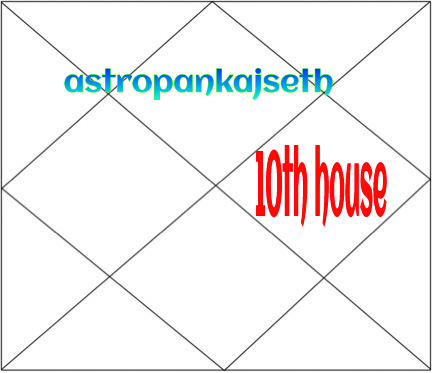 10th House is also member of Upchaya house of your horoscop. 3)Karak matter—Profession(Which is the real part of your method of earnings to survives in this world),Growth,Authority(Government or your Boss),Your Social Conduct,Knees,Father. 4)Kalpurush concept–10th House belongs to knees of Kalpurush and its natural Zodic is Capricorn(Makar) and its lord is Saturan. So it is belongs to south direction and Tamas(Tamo)Gun.That’s why Saturan is a natural karamkarak.10th House belongs to knees so all knees related problem belongs to 10th House. 5)House of Profession–10th House is house of Profession so your bussiness,jobs, career belongs to 10th House.What is your jobs?? ?,what type of bussiness you done!!! All answer related to your 10th House. Extended it any matter belongs to your profession related to 10th House.Growth in career,bussiness,promotion,Fall in career,suffering in career,Good deeds in bussiness, bad deeds in bussiness, related to this 10th House.Further extended it 10th House belongs to your work place so any event related to your workplaces belongs to 10th House.Problem with your co-workers,good relationship with your co-worker belongs to 10th House. Fixed work place, movable work place, change in work place(Your transfer,posting),promotion,demotion, suspension belongs to 10th House. Your good achievement in work,great projects, belongs to 10th House.Your travel regarding work(Bussiness trip,Seminars, other such type travel) belongs to 10th House. 6)Your Social conduct–4th house of your horoscop belongs to your private life and 10th House belongs to your public life. What you shows publicly belongs to 10th House. My mean your Social behavior is related to your 10th House.Extended it so your conduct ,Your reputation,Your Honour belongs to 10th House. Further extended it Your dignity,your awareness, Your self respect,Your social Fame,Your Pride,Your rank,Your Social status belongs to 10th House. All this matter is belongs to increase or decrease your fame so Fame is belongs to 10th House. 7)Kingship—10th House is karak house for kingship. So all matter related to king is belongs to 10th House. Now Kingship is converted into Government so all government related matters belongs to 10th House.Government is another form of authority so Authority belongs to 10th House.So your Boss belongs to 10th House.Administration,Big MNC,Higher authority also belongs to 10th House. So all profit and loss from government or other such organisation belongs to 10th House.So Your Chief minister,Primeminister or King is belongs to 10th House. 8)Father—Just 7th from 4th house(Mother house) so it is also related to your Father.